Whisker Graphics: Featured in a Treasury! Elena at Tickled Pink Knits (take a peek at her shop, down right beautiful pieces) has put together a very lovely treasury called "Oh Honey Brown Bear" (super cute title) and included my "New Hive" moving announcements. 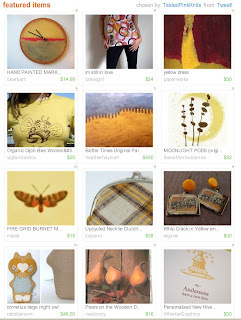 Elena did a fabulous treasury and I love the mellow yellow vibe! Thanks for including me!